100% pure and Certified organic by Soil Association. (Licence number DJ21110). Solid, white oil. Saturated fatty acids, close in molecular structure to natural sebum. Often used for moisturising skin and conditioning hair. Helps to keep skin soft and supple without being greasy. Coconut oil is often used to strengthen and condition hair and considered helpful to moisturise the skin and prevent stretch marks. Coconut oil is a white solid at room temperature, but it will turn to a liquid state in warm temperatures. 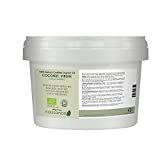 Coconut oil has a number of uses, such as an emollient for skin and hair and it is particularly suited to oily skin. This oil can be used in homemade products like deodorant bars, balms, creams and lotions, an effective eye make-up remover. It is thought to help prevent stretch marks during pregnancy and it is often used as a hair conditioner, shaving oil and facial moisturiser. Coconut oil can also be used as a base for massage and blended with essential oils for added aromatherapy benefits. Tea Tree oil is a pale, yellow-green mobile liquid with a fresh and warm, camphoraceous aroma. The oil is well known for its purifying and cooling properties. The oil is extracted from the twigs and the leaves of the plant by steam distillation. Tea tree is a well-known oil for cleaning and protecting the skin, thanks to its highly effective purifying effect. It is popular for use in treating skin problems and for foot care. In aromatherapy, tea tree oil is used to provide a purifying effect on the senses, helping to maintain healthy breathing and a strong immune system. Cinnamon, clary sage, geranium, lemon, lavender, nutmeg and rosemary. 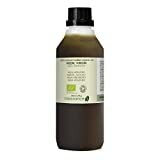 Organic Neem Virgin is useful for headlice, as it is an excellent repellent.